Alone In The Dark is a series that, long ago, meant something. 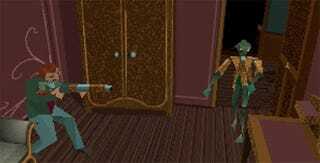 It was the original 3D survival horror game, and the first two titles weren't just terrifying and a blast to play, but had a gorgeous old-timey art style as well. In later years, though...well, let's just say time and some publisher misdeeds pissed that legacy away. There hasn't been an Alone in the Dark since 2008's dreadful reboot at the hands of Atari, but hey, that's not stopping whatever company inherits the old brand name these days from waiting a few years and trying again. At this year's PAX, the publisher will be showing off a game called Alone in the Dark: Illumination. The developer is a studio called Pure FPS that I can't even find a webpage for. The press release describes it as "re-imagined". I am afraid, then, but not in the way Atari is probably hoping. As a chaser, then, here's a playthrough of the first game.